Fire in Middle: Mystery of the Great Pyramid Solved is a nonfiction speculative work written by James Ernest Brown. Brown has been studying the pyramids of Egypt for over forty years. His research has led him to believe that the commonly held theory that the pyramids were used as burial chambers is incorrect. His professional knowledge of building and construction assisted him in developing his theory and laying out his arguments for his belief that the Great Pyramid was used in a chemical process that relied on water provided by the Nile River, which was then electrified and used for the general well-being of the ancient Egyptians. He shows how the sarcophagi found in the King’s Chambers were more likely used as part of the catalytic portion of the process than as the resting place of ancient Egyptians -- making note of the drainage openings found therein which had no purpose or place in the burial process. Brown has taken over 10,000 photographs of the pyramids of Giza and other ancient Egyptian structures, and he uses them to defend his theories. He also includes an extensive list of references and recommended readings. James Ernest Brown’s nonfiction archaeological work, Fire in Middle: Mystery of the Great Pyramid Solved, is a fascinating and persuasive work that kept me happily studying his pictures and reading his arguments for quite some time. His pictures are stunning and bring the learning experience to a new level. I also appreciated the archival quality of his photos, many of which were taken of areas and locations which are now closed to the public or forever altered. While I was inclined at first to be somewhat skeptical of Brown’s premise, I found that his arguments made a lot of sense, and the evidence provided by his photographs was persuasive indeed. Brown’s presentation of photographic evidence and his clearly elaborated discussions made what could have been a dry and overly technical treatise into an accessible and well-documented study of an alternative theory of the purpose of the Egyptian pyramids. Fire in Middle is an absorbing and well-presented treatise that actually takes the reader deep within the pyramids themselves via Brown’s photos and proposes a plausible and convincing theory about the function and purpose of the Great Pyramid. Fire in Middle: Mystery of the Great Pyramid Solved by James Ernest Brown is an absolutely fascinating read that speaks about the author’s visit to Egypt with a team of seven other people to understand the true purpose of the Great Pyramid and his conclusions about it. The step-by-step journey through the Great Pyramid, and the other pyramids in surrounding areas, throws light on how the author has come to the conclusions that the pyramid fits the profile of a type of chemical laser and that the Giza Plateau functioned as a massive industrial complex. The book also explains why the author believes the Great Pyramid functioned as a type of closed cycle fluoride/hydrogen gas laser. For all those readers who are curious to learn about the Great Pyramid, this book is fascinating as they go on a journey of discovery with the author. Egypt is a country filled with intrigue and mystery and the Great Pyramid of Giza is different from the other pyramids in Egypt. In one chapter, the author takes readers on a pictorial journey through the Great Pyramid and the other pyramids which is helpful when it comes to removing misconceptions and false information they have about the pyramids. The pictures and diagrams help readers understand the architectural principles of the Great Pyramid and a lot of facts about Egyptian culture, ancient Egypt, and their beliefs. The author handles the topic extensively and speaks about how the Great Pyramid also has a source of power which is always present. I must admit, I love ancient mysteries. I like the idea that our distant ancestors knew, and saw, a lot more than is passed down in traditional histories. I am a fan of the theory that we may have been visited by aliens in our distant past. I believe we had help. The pyramids are one of the greatest mysteries of the ancient world and I was very impressed with the theories that James Ernest Brown laid out in Fire in Middle: Mystery of the Great Pyramid solved. I won’t tell you what the main theory is in this review. I hate spoilers. But I can tell you that James Ernest Brown is an experienced general contractor, and his approach is taken from the angle of an architect or engineer. I found it sensible and full of the practical points you would expect to find from someone working in the construction field. Not only are James Ernest Brown’s theories practical and based on common sense, but he also has a talent for laying them out clearly and succinctly. I found Fire in Middle easy to read and I found the ideas easy to follow, even though I don’t have a technical background. There were a lot of pictures and diagrams that helped put you there on the spot, so that you could get an idea of how he came to his conclusions. I like that. There is not a lot of over explaining, just one straightforward message. So if you are fascinated by the pyramids or ancient mysteries in general, you will definitely want to read Fire in Middle. Fire in Middle by James Ernest Brown is the second of three volumes that include research from a series of expeditions, going to locations such as Giza, Luxor, Saqqara, Abydos, and Abu Simbel. This educational memoir highlights Brown's personal experiences as he researches pyramids, and uses hieroglyphics to show how Ancient Egyptians used energy, electricity, and water for various daily purposes. Complete with over three hundred photos, diagrams, and illustrations, Brown creates a guide that provides historical context, accurate details, and a personal adventure within the Great Pyramid. James Ernest Brown takes apart every aspect of the pyramids' construction in order to clearly explain how each part functions. The photos and illustrations allow for a visual element as he highlights from the entrance to passages to electrified water leaving the pyramid. I was intrigued by the chapter where Brown shows how “electrified water is used in many Egyptian tomb paintings.” The topic is unique and engaging, with the author going far beyond how a pyramid is derived, and includes a brief history on the use of crystals. Every detail and piece of historical background is well researched, backing Brown's argument and truly made me think. Brown succeeds in his goal, as he presents supported arguments as to why the typical interpretations of the pyramids need to be reevaluated. Fire in Middle is fascinating, in depth, concise, written in clear and easy to understand language. The perfect tool for those wanting to learn how pyramids work, and those fascinated with Ancient Egyptians and their use of electricity. Egyptologists and historians alike claim that the Great Pyramid of Giza was once a burial site for an ancient pharaoh, but what if those beautiful structures were actually something else entirely? A careful and thorough evaluation of the pyramids just might prove that there was an entirely different purpose in mind when the pyramids were built. This book delves right into the midst of history that many thought was long settled, and raises new questions if that history is to be believed. How would the servants have gotten a body up through the Ascending Chamber, if that were the purpose, when it’s only 4 feet tall? How would they have moved multi-ton blocks directly into that same chamber and then tunneled their way back out, if that were the purpose as well? James Ernest Brown answers these questions in Fire in Middle: Mystery of the Great Pyramid Solved; they didn’t, because the pyramids weren’t for burials after all, but for something far more advanced. Fire in Middle is a really great book for showing you just what may have been happening in the pyramids. Brown conducted extensive research over many years that shows what appears to be an energy source, rather than a burial chamber, and it could unlock some amazing things about history and the Egyptians if more can be found out about it. This book is amazing and it shows every step in the process that James Ernest Brown took in order to create his theories, with images that show you absolutely everything so you can make your own decisions and evaluations as well. It’s nearly impossible to imagine the ancient Egyptians with electricity and a renewable energy source, but if James Ernest Brown’s research and evaluation in Fire in Middle is correct, that’s exactly what it means, which could indicate something entirely different for our future. The compelling non-fiction book, Fire in Middle (Mystery of the Great Pyramid Solved) by James Ernest Brown, presents a revolutionary and groundbreaking hypothesis relating to the purpose and use of the Giza pyramids. The current theory is that the pyramids were tombs of the ancient Egyptians. Contradicting this belief is the reality that there has never been a body found in any pyramid, nor are the pyramids built consistently with the traditional burial customs of the ancient Egyptians. The author, a general contractor for over fifty years, states that the structure of a building should be based on its purpose. In his studies of the pyramids' configuration, he concludes that they significantly fail to meet the criteria for the construction of a tomb. With his knowledge and decades of personal research, founded on scientific methods and principles, the author has come to an astounding conclusion. The design of the pyramids and their interior rooms and passages are similar to the schematics of the patented technology of chemical engineering. Can this affect us now? How can we benefit from this new knowledge? 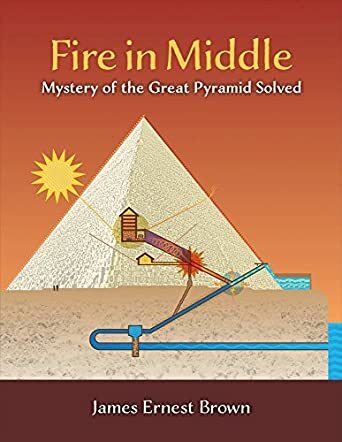 Fire in Middle (Mystery of the Great Pyramid Solved) by James Ernest Brown is a brilliant and innovative non-fiction book investigating the mysteries of the pyramids. It is an exciting and profound analysis, summarily dispersing the scientific communities' assertions of the ancient Egyptians' lack of intellectual ability to understand technology. Dispelling preconceived ideas and initiating a fresh view of history, the reader can't help but be excited by the far-reaching concepts. Though the theories may seem radical at first, they are presented logically and credibly, making it easy to understand and appreciate the elegance of their premise. With the author demonstrating his hypothesis with relevant facts and details based on scientific principles and research, this is an exhilarating and eye-opening book that will delight those who like a fresh and insightful view of history.